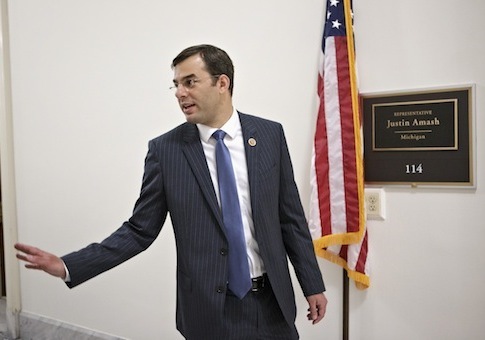 I consider Congressman Justin Amash a libertarian-lite. That said, he is the best in Congress right now, so it is shocking to see Dan Scavino, the director of social media and Donald Trump adviser, calling for Amash to be defeated in the nest primary. He also calls Amash a big liability. You know why? Becasue he is the only one that is occasionally challenging the President's interventionist plans. Amash did not support the horrific Ryan-Trump healthcare plan, for example. And becasue of his anti-big government stance.this is his reward. I wonder how libertarian Trump fanboys will spin this. He's been attacked by Coulter and other Trumpets before now they're making it official. Amash to his credit has the record to back up his opposition to the National Security State. I have no qualms sending him money to defeat whatever socialist the Trumpets put up against him. I wonder who Walter Block supports in this fight! Well, I don't do politics, but just maybe I'll slip a few FRN's to ol' Justin for his campaign. Uh oh, this is starting to sound like the Republican establishment going after Ron Paul in every primary again. These comments are spot on.